This project calls for vodka. Do try and keep it away from the baby . . .
Have you started making your holiday gifts yet? What?! It’s already that time of year again? I know, I know . . . This is a project that i’ve been meaning to do for years – yes, literally years – but it takes a few weeks to complete, and I’d never had my act together far enough in advance. But this year . . . this year I remembered! And I took myself and my baby to the liquor store, and we got us some vodka, and we went to the herb shoppe, and we got us some vanilla beans, and we got this project started a whole whopping 6 weeks ahead of deadline. Woo-hoo! * Note: I used 4 vanilla beans in a standard 750 ml bottle. Adjust the amount of beans to suit the volume of vodka you use; err on the side of extra beans. 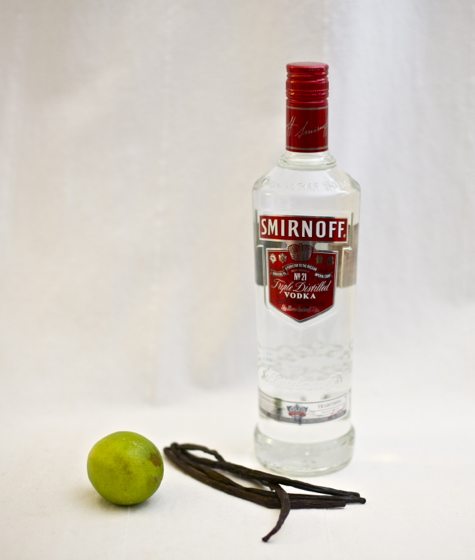 To make your extract, begin by pouring off about 2 shots worth of vodka. Maybe pour them over ice into a swanky lowball (or small mason jar if you’re a hippie like me). Maybe add some lime soda and a liberal splash of lime. Maybe . . . wait what? Oh yes, the extract. Cut the vanilla beans into pieces. Drop them in the vodka. Pour the solution through a mesh strainer or cheesecloth, then transfer to small bottles. Pretty bottles work well if you’re gifting. If you’re just making this for yourself (it’s significantly cheaper than buying real vanilla extract), you can simply use old maple syrup bottles, old salad dressing bottles, or even old mason jars. The end, so easy. Now, about that cocktail . . . I need to do this! I find myself buying vanilla all the time. And it’s so damn expensive! Next time I’m buying one bottle to tide me over, plus vodka and beans! I made this last year & gave it as presents & it was a hit! I put them in pretty colored bottles with homemade labels. I didn’t make mine on time, so each one had its own vanilla & the label said “do no open till…” Hehe Anyway, I use my extract all the time…hot chocolate, baking, coffee, oatmeal, etc. SO yummy! love this idea! i have a feeling a trip to the corner store is in my future. p.s. how cute is waits up there in that picture? !…so flippin cute! PS. I also didn’t use Vodka, I used Rum! So funny… I just decided a couple weeks ago to make a note to do this for next year for gifts. I’m going to make some for myself, but what I had read said to steep for 6 months preferably. I’ll probably do three. Amazon (love it!) seemed to have a decent price on vanilla beans. lol that first picture kills me. 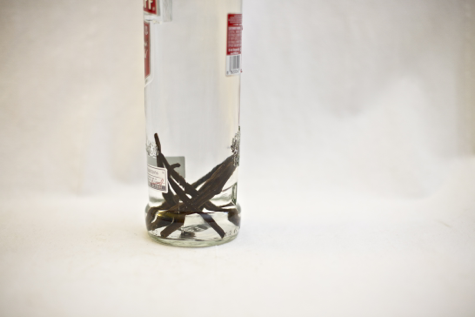 I have always wanted to try making my own vanilla extract… but have never gotten around to it. Maybe this is the year! Ah yes, a good friend of mine gave me some beans from Madagascar earlier this year. I put each one in small jars to give as gifts. They’ve been steeping for at least three months now.. I’m so tempted to try it! Oh that sounds good! My man loves infusing homemade cocktails (fig and vanilla whisky, lemoncello, etc. ), you’ll have to ask him about it sometime! Hi, I’ve been following you for almost a year and I wanted to say that I admire what you do and how you live. With your post I’ve discovered Kombucha (I brew 6 L a week for my family), I’ve been no-poo for 6 months and so on. Thank you for sharing your experiences, you make a difference. I have more and more integrety in my life and part of that is because of you. I make mine using all organic ingredients! 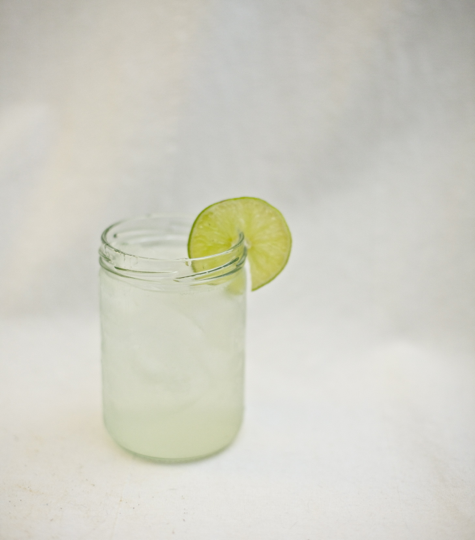 We get our Organic Tahitian beans off ebay and we use Prairie Organic Vodka-it just adds an extra amount of awesome! This also works great with saffron, violets and chillis. When I was bar-tending, I’d use them in drinks, and now that I’m not, I use them in cooking. This year’s batch of saffron and vanilla are ‘brewing’ at the moment, and I’m putting on a batch of limoncello tonight! So many great ideas here! I love the idea of individual beans-per-bottles. And I totally want to do other infusions . . . it shall be my New Year’s project! That’s such a cute idea, I love it! Uh-oh, I hope I haven’t underestimated. Eep! Plus, damn I owe you an email . . .
Wow! Thank you so much Gabrielle, what an amazing thing to say. I can’t tell you how much that means to me. Thank you! I want to make pineapple jabanero vodka! I’ve been doing this a few years now..I live in Germany, and have never seen extract here. If I did I’m sure the price would be obscene. When used in baked goods, it tastes just like it should! Oh this looks so easy and of course I could find a use for those extra two shots. So much nicer to make it yourself. Easy! Split the jabaneros and pop them in the bottle, same as you do with vanilla. The longer you leave them in, the hotter and more flavoursome it will get. The pineapple might be a bit harder (goes squishy), but can’t see why the same method wouldn’t work, with a straining step between infusing and storing/drinking. Awesome, thanks! I’m going to try it! There is an all organic vodka made in Minnesota, the name slips my mind at the moment but we used to keep a few bottles on hand when I worked in a convenience store with a liquor department. I started this project way back in March, somehow thinking I would be doing a lot of baking in the summer (hah!). I purchased a 1/2 gallon of vodka, filled 2 qts (12 beans each I think?) and ended up with just enough leftover to make a pint of kahlua with the remaining vodka, beans and a bit of coffee syrup. 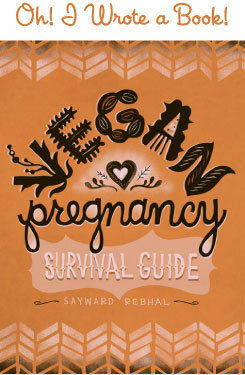 No cocktails while gestating a new little one. I started using the extract after about 2 months and it was good. As good as or better than any 100% extract out there. Now though, oh my word, this stuff is AMAZING! If you have the time I highly recommend letting some sit for an extended amount of time. I will be bottling at least half of my batch for Christmas gifts and I’m going to try using the same beans for vanilla sugar after they’ve been removed and dried off. I heard bourbon is ideal for vanilla extract, thanks for the inspiration! It’s yummy…and gives it a nice pretty, warm color & extra spiciness! I just wanted to tell you that I looked on the web for some reciepes and the the first one I read called for 12 beans for a 750 ml bottle of vodka! And to step for a min. of 2-3 months. What do you think about that? 12 beans! Anyway, wonderful idea (yet again!) I can’t wait to start. I’ve done this with two pods, though its not very strong. I just use more of it. I write the date on the bottle but I am really not sure how long it takes to infuse adequately. Leave the pods in the bottle. Organic vanilla beans can be expensive, I found a good deal on ebay. Uh-oh! Yeah, it sounds like I may have underestimated this one. I’m definitely going to update the post once it gets a little closer, but thanks for the heads up! We get organic Samoan vanilla beans here, in larger health food stores. It’s pretty damn good. Think I’m going to make this with 12 beans and then if it’s super strong just use less. I know… you posted this a year ago… I ask just in case you can still get this message… How do you make the limoncello??? 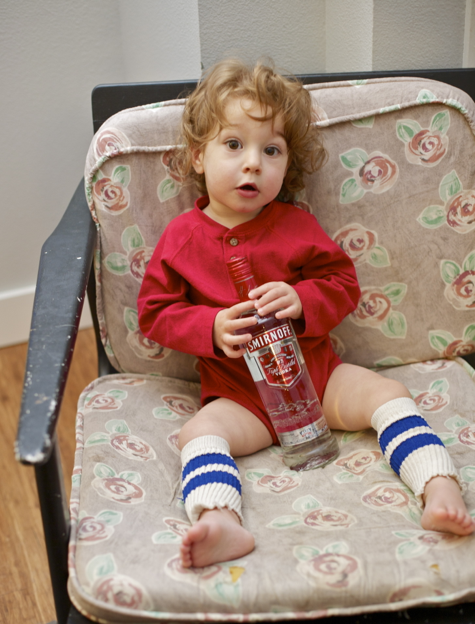 An which quantity of saffron in which quantity of vodka?